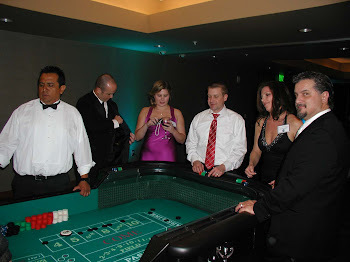 For your next event, consider an Arizona Casino Knights hosted poker tournament. Our tournament directors are trained to run an event like those seen on television. Team Building - See who is the best poker player in the office. Bragging rights are at stake! Client appreciation - Thank your clients with a fun evening of poker. If you ask each client to bring a friend, you can even use it to increase your business. Bar or restaurants - Reward your loyal customers with a chance to win free food and prizes. Just for fun - Poker tournaments are great fun, why do you need any other excuse? As your guests arrive, they will select a seat card. This will tell them their starting table and seat number. Upon arriving at the table, the dealer will direct them to their seat, collect the seat card and give the player his starting chips. Once all of the players are seated, the tournament director will announce to the dealers to "Shuffle up and deal" as seen on many television poker tournaments. Any late players will still be allowed to play. A position will be held for them and any blind bets will be removed from their chip stack as if they were folding every hand. Play begins with each player receiving an equal amount of chips. There will be two blinds posted per hand to force the action. As play progresses, the amount of the blind bets increase. The tournament director will customize the blind amounts based upon the starting chip count, number of players, and length of the event. Most events are scheduled for three hours but larger events can take longer. As play continues, players will be eliminated from the tournament. 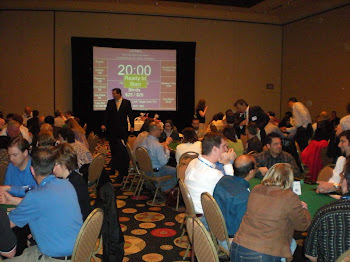 The tournament director will continually move players around and break down tables to keep the same number of players at each table. Once we are down to nine players the final table will begin. Play will continue until one person accumulates all of the chips and is declared the winner. 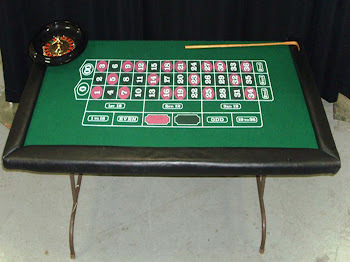 Tables - We use high-quality Texas Hold'em tables. They have padded railings with cup holders and professional felt used in many casinos. Our tables seat nine players plus the dealer. Arizona Casino Knights only provides tables. The client will need to supply 10 chairs per table. Tournament Director - The tournament director will be the main person in charge of your event. He will set the blinds and chip amounts to make sure the event ends on time. He also is in charge of moving players and breaking down tables until the final table is reached at which time he will announce the action to spectators until a winner is determined. 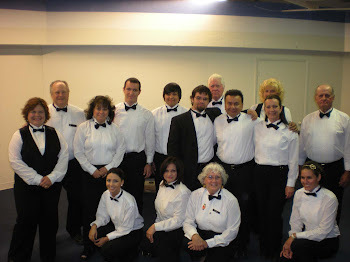 Our tournament directors employ the rules developed by the Tournament Directors Association and used in many big buy-in professional events so that your event is run to the same standards as a televised poker tournament. Tournament Software - We employ tournament software to track play and blind levels as well as to keep the tournament clock. We can also provide a projection system for larger events to display the event information onto a screen to keep all players informed about the progress of play. Accessories - All of the chips, cards and other accessories needed to run a tournament. We use 100% plastic GEMACO playing cards like those used in many casino poker rooms.